Over the past three years, SPRING has helped USAID and its partners design, implement, and monitor agriculture activities for better nutrition. SPRING documented observations, lessons learned, and recommendations while providing technical assistance to USAID Missions and implementing partners in linking agriculture to nutrition. Document achievements and challenges of the U.S. Government’s investments in climate-smart agriculture (CSA) and nutrition. Make recommendations for future programs, emphasizing effective ways of working across sectors to improve nutrition outcomes. In late 2016, SPRING managed a global review of Feed the Future, the U.S. Government’s global hunger and food security initiative, whose activities affect nutrition through three primary impact pathways: production, income, and women’s empowerment. technical experts in CSA, gender, and nutrition. Progress on implementation in priority countries. Reduced the need for fertilizer through promotion of fertilizer deep placement methods. Benefit: These actions mitigate threats to food security by increasing yields and income, enabling rural farming households to invest in adequate diets and meet health and child care needs. Farmers learned about conservation tillage and the best crop varieties for changing climates. 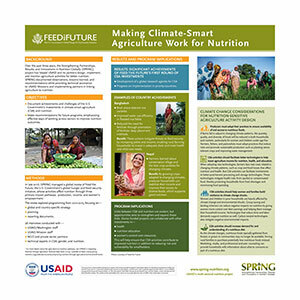 Benefit: By growing crops adapted to changing climates, producer households can stabilize their income and improve their access to diverse foods, which supports good nutrition. This will help ensure that CSA activities contribute to improved nutrition in addition to reducing risk and vulnerability for smallholders. Producers must adapt their practices to ensure availability of and access to nutritious foods. If farms fail to adjust to changing climate patterns, the quantity, quality, and diversity of foods will be reduced in both households and markets, particularly for women and children under age five. Farmers, fishers, and pastoralists must adopt practices that reduce risks and promote sustainable production such as planting stress-tolerant crops and improving water management. CSA activities should facilitate better technologies to help boost agriculture income for nutrition, health, and education. When adopting new technologies, farmers face real costs related to changing climate patterns, such as crop and food losses that affect nutrition and health. But CSA activities can facilitate investments in better post-harvest processing and storage technologies. These technologies mitigate health risks from spoiled or contaminated food, thereby protecting households from food shortages and minimizing food spending. CSA activities should help women and families build resilience to climate change shocks. Women and children in poor households are heavily affected by climate change and environmental shocks. Group saving and lending schemes can reduce negative impacts on nutrition by giving women more control over their earnings and helping them manage their household income. Technologies that reduce time and labor demands support nutrition as well. Carbon-neutral technologies also mitigate negative environmental impacts. CSA activities should increase demand for and understanding of a nutritious diet. As the climate changes, nutritious foods typically gathered from forests or grown in communities may no longer be available, forcing rural families to purchase potentially less nutritious foods instead. Marketing, media, and professional and peer counseling can provide households with information about what to consume as part of a nutritious diet.